What elements of “Brexit” can we find in the latest elections in Europe held in Slovenia on 3 June 2018? Two issues that came to the fore in Slovenia were migration and healthcare. As was the case for UK voters in the Brexit referendum, these are two of the main concerns of Slovenians for the future. The Slovenian Democratic Party (SDS; member of the European People’s Party) won more votes (25 per cent) than other parties because it addressed both. Foreign media have written much on the electoral issue of migration in Slovenia. The overall judgment on SDS’s victory has been that Slovenia has moved towards an anti-immigration populism à la Viktor Orbán. Without a doubt, the Slovenian Democratic Party wants to stop illegal immigration (however, bear in mind that illegal immigration is mentioned only once in their program; at the same time the program does not mention how Slovenia can benefit from legal migration). To attract far-right voters its electoral rhetoric with respect to certain minorities was at times offensive and alienating to its voters at the centre, yet, according to SDS, it was respectful of freedom of speech. It is also troubling that the party has nurtured a close relationship with Orbán, closer than with any other leader that is associated with the European People’s Party. All these indicate that Slovenia has moved somewhere, yet, it is a mistake to believe it has only moved to the right. Foremost, Slovenia has moved to greater political fragmentation. With an unprecedented number of elected parties (9 in total), Slovenia is bound to worsen its governability problem. Already there is a tendency for Slovenian governments to be short-lived: the parliamentary elections of 2011, 2014 and 2018 were all early elections. The SDS won 25 seats in the 90-seat legislature, far short of a majority. Forming a coalition will require at least 3 to 4 parties. The Slovenian Democratic Party cannot form a right-wing government (SDS + NSi + SNS) without including the newcomer Lista Marjana Šarca or parties from the left. A left-wing government (SD + SMC + Levica + SAB + DeSUS) can neither be formed without the Lista Marjana Šarca or parties from the right. 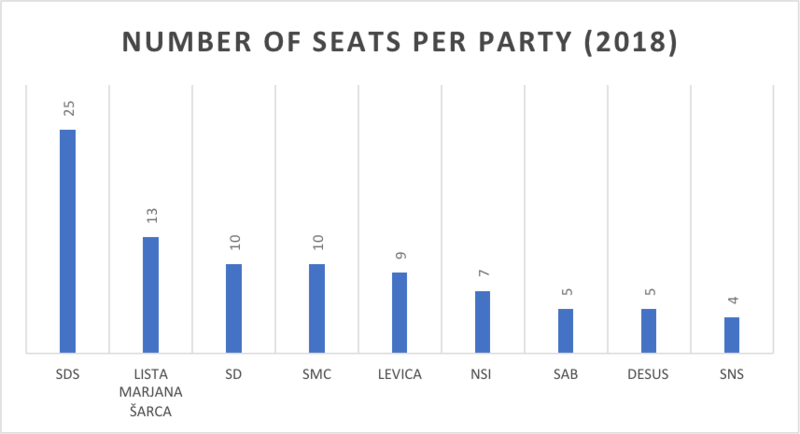 Only a centrist government (SDS + Lista Marjana Šarca + SD or SMC) can ensure a relatively stable government, with opposition on the left and right. Given the possibilities of government, Slovenia has not dramatically shifted to the right – at least not because of the Slovenian Democratic Party. However, there has been a movement towards the political poles on the right as well as the left. For the first time since 2008, the Slovenian National Party (SNS; affiliated to the Alliance of European National Movements) was elected (3 seats). Among other things, the party is known for its anti-Croatian rhetoric, which is likely to cause trouble in the already difficult border dispute between Croatia and Slovenia. On the left, there is Levica – the party that the famous Slovenian philosopher Slavoj Žižek declared to be Slovenia’s “only glimmer of hope”. This party has now 9 seats in parliament, which is 3 more than in the last term and one less than the centre-left Social Democrats (SD). SNS and Levica are anti-NATO and have a Eurosceptic platform. SNS advocates for the exit of Slovenia form the EU (aka Slovenexit). Levica does not advocate for a Slovenexit in its programme. However, it maintains that the European Commission promotes the exploitative nature of capitalism and the free market. With only a couple of parliamentary parties adopting a generally Eurosceptic position (representing 15 % of the voters in 2018), Slovenexit is not on the horizon. Siding with Orbán on immigration will not make Slovenia many friends in the EU either. Politics à la Orbán has likely already harmed Slovenia. In May 2018, the European Commission in fact proposed a reduced Cohesion Policy budget and more stringent rules in part as a response to Visegrad 4 anti-democratic and anti-EU-values moves. Slovenia is a net beneficiary of the EU budget and relies on Cohesion Policy for its development. On the other hand, it is a homogenous country, where a debate on migration (legal or illegal, inward or outward) has yet to happen. The unwillingness and/or inability of political parties to address migration in a sensible way is not unique to Slovenia or the UK but is common throughout the EU. And while mainstream party politics in Slovenia are quite different from those in the UK, Slovenians share many concerns with the British and other Europeans. Healthcare is probably at the top of these concerns. Like the UK, Slovenia records low numbers of doctors and nurses, and the financing of the system is under pressure. Patients in Slovenia sense varying care quality throughout the country and there is a perception that by paying one can get around (too long) waiting lists for public care. In the latest Eurobarometer on EU Cohesion Policy, 92 per cent of EU citizens said healthcare should be an area of priority investments. A similar response has been documented in the COHESIFY focus group research. Co-financing from the EU budget can, for example, help the maintenance of hospital infrastructure. On the other hand, the EU has (rightly) very limited input in the health policy of its member states. These are the type of discussions Slovenians and other EU citizens need to be involved with. Communication of the benefits of EU membership will be key in Slovenia if politicians want to avoid the perils seen in “Brexit”. Andreja Pegan (@AndrejaPegan, www.pegan.org) is a Research Fellow at the DCU Brexit Institute. Before joining DCU, Andreja was a research fellow at Trinity College Dublin, where she worked on the Horizon 2020 project COHESIFY – The Impact of EU Cohesion Policy and European Identification.